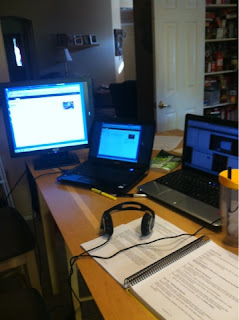 This is my kitchen table, with 2 laptops and a monitor. I'm taking a remote class from home this week to learn more about SharePoint. It's been a great week -- very informative and I can throw in laundry while I'm on break! I need 2 laptops so I can watch the class on one, while accessing the remote computer from the other. My poor eyesight meant I couldn't see the remote PC, so Bo set up the monitor so I could actually see the icons on the screen. Taking a class remotely requires strong attention skills, because it is easy to become distracted. Luckily, I'm really interested in the topic, so my days have seemed to fly by and I've picked up some very useful information that I will be able to use in my classes. The instructor has been great -- very knowledgeable and entertaining, which also helps make the experience a good one. I'm back in front of the classroom again next week, but I've enjoyed being behind the desk this week!